Pilates is a safe, challenging, full body, low impact workout designed to build strength, body awareness and control. Founded by Joseph Pilates in the 1940’s as a method for rehabilitating war veterans, it’s still used today by seasoned athletes and non-athletes alike to create muscular balance, increase strength, reduce back pain, and prevent injury. Pilates is an exercise for every fitness level, gender, age and body type. Pilates can make you feel better, taller, stronger, and more capable while doing your everyday activities, like: loading up your groceries, picking up your grandchildren, or training for an Ironman. At Kinesis, we focus on the six core principles of pilates: concentration, control, centering, precision, breath and flow. 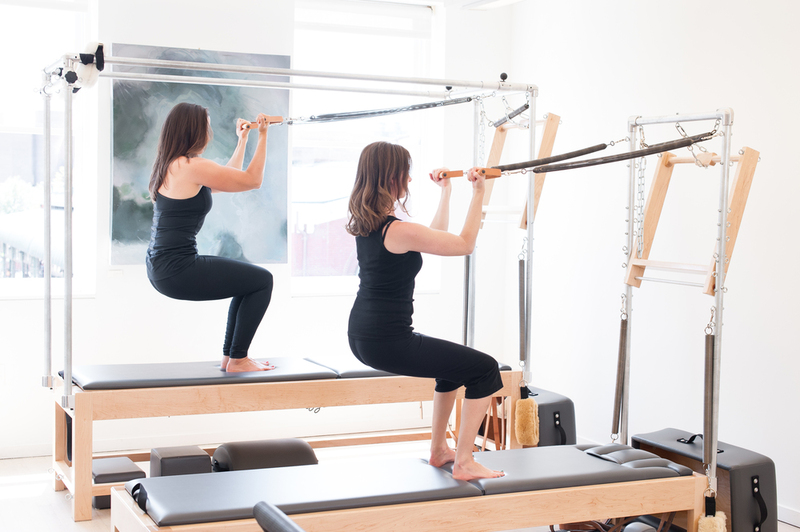 Our practice is strongly rooted in the classical system that Joseph Pilates intended, but we take a more contemporary approach when it makes sense. With new discoveries in human anatomy, and new experiences with individual clients, we continue to find ways to modify and adapt the classical system in order provide our clients with a tailor-made, safe and effective workout. In an effort to make the best experience possible for our clients, we restrict the number of sessions per hour so at any given moment, there are no more than 3 clients being trained at the same time. In addition to one-on-one instruction, duets and trio sessions are also available for those who currently practice or have practiced pilates in the past. For those new to the studio, but not to pilates, we require a initial private session so that we may better understand your needs, and know that you have a comprehensive understanding of the foundation and functions of the Pilates exercises. This is for your benefit and understanding, so that we may best serve you when there is more than one person in the session. We are a comprehensive studio and utilize a variety of apparatus and accessories in each session. Some of those items include: Cadillacs, Reformers, Tower Units, High chair, Wunda chairs, Arm chair, Spine correctors, Small barrels, Large barrel, Ladder barrel, Ped-o-pull, Foot Corrector, Sandbag, Magic Circles, and many other small accessories such as weights, balls and bands. We are hiring! If you are interesting in teaching pilates here at kinesis, please email info@kinesisdc.com. Have a friend that is currently certified and possibly looking for a change? Pass along our email address. Interested in becoming a certified instructor? Email us and we will tell you how we can help you make that happen.